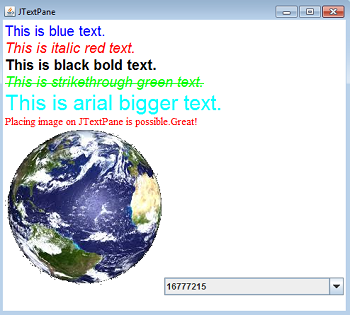 JTextPane is a text component that you can apply different styles or attributes set to different parts of the text. Placing any component or image to the JTextPane object is allowed. In the example code below, each line of text int text pane is marked up with with attributes (color, italic, bold, strikethrough, font name, and font size). creates a new text pane. creates a enw text pane with a document model. returns the character attributes at the current caret position. adds the specified component to the text pane at the current caret position. adds the specified icon image to the text pane at the current caret position. specifies the text insertion caret position. In the example below, the JTextPane component is used to display text, image, and a combobox. Every line of the text is styled differently. The setCharacterAttributes method is used to apply styles to the text. You need to define the attribute sets and supply it to this method. A single style attribute can be constructed by using the NameStyle class. It is the sub-class of the StyleContext classs. The StyleContext class has a method called addAttribute that allows you to combine the attribute object with another attribute so that it creates a set of attributes.